These are trying times for Black activists, for feminists, for Black feminist activists–hell for anyone who has a modicum of awareness. In this era of Black Lives Matter (#BlackLivesMatter), what is needed are safe spaces to express authentic feelings without consequences, and mentoring as a form of shelter–where folk can retreat to for solstice and sanctuary. This was brought home to a me a few years ago when I commented on a post in Anthropology News. 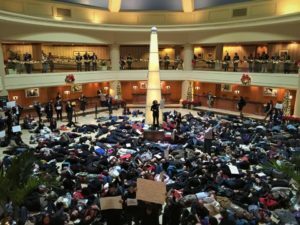 Written by a young black feminist activist, Donna Auston, who bravely had organized a “die-in” at the 2014 annual professional meeting of the American Anthropological Association. Her goal was to draw public attention to the Black Lives Matter movement, and the deaths of unarmed black men that seem to be increasing with a ferocity not seen since the Jim Crow era of lynching. What “drama” — in the best sense of that word. And all of this took place at a professional academic conference attended by over 8,000 anthropologists of all ilks from around the world. And, it occurred in the main hotel lobby. After the event, Auston posted her thoughts in Anthropology News about this public act of solidarity with the Black Lives Matter movement. “I have never died before. In the beginning of December, at the annual meeting of the American Anthropological Association in Washington, D.C., I made my way down to our hotel’s main lobby with a few of my friends, to join hundreds of my colleagues for a die-in, a powerful, symbolic protest against the continuing epidemic of extrajudicial killings of black citizens by police and vigilantes. We gathered a few minutes before the scheduled time, as instructions for how to begin arranging our standing bodies around the rotunda were whispered from ear to ear. “If you are planning to die, please make your way into the center of the circle, those who prefer to watch on the outside.” People began to hold up signs hastily scribbled on poster board and plain old blank office paper: “Black Lives Matter”, “Justice for All”—while one of the main organizers—a caramel-colored sister-scholar-organizer dressed in all black stood up on the pedestal that held up the tall, dangerously pointed objet d’art which marks the exact center of the lobby. Her muted signal came before I felt quite prepared. With a calm, direct, downward gesture of the hand we were informed that our time had come. Ready or not, it was time to die. 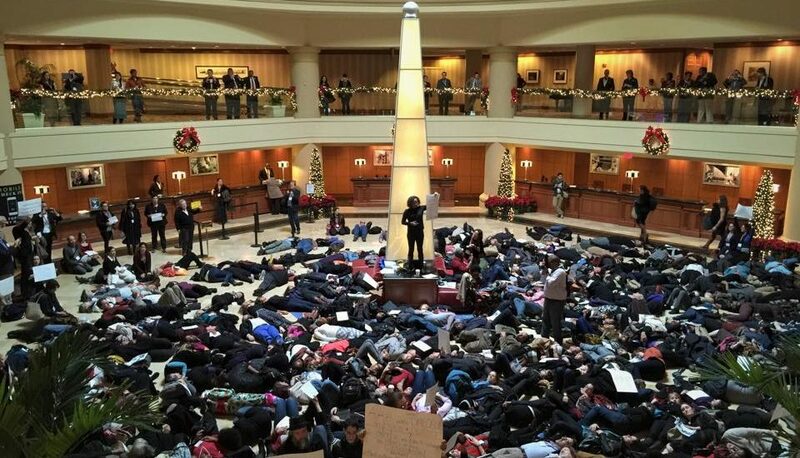 I am the author of the piece “Recalled to Life” on the die-in at the AAA conference this year. …We haven’t met before, but somehow I was just now able to see the wonderfully encouraging comment you left on the website under my article. I wanted to reach out to you personally, because after what has been a truly challenging week on a number of fronts, your words brought a real smile to my face. Thank you so much for the encouragement, for the support, and for the vote of confidence–it means a lot. I hope that we are able to connect in person some time very soon. It would truly be an honor. Thank you for everything. Well said Sister anthropologist Auston. Praise be to those who mentored you and taught you to be bold. Many of us are aging, and we need to know there are still academics with fire in dem belly to carry on. We need to know that anthropologists (and especially Black Anthropologists) are connected to the everyday lives and events of social world where injustice reigns large. We need to know that you will continue to fight the good fight within the academic corridors and departments of anthropology and other disciplines where our white colleagues conduct research on social injustices around the world and practice intellectual racial brutality in their own departments, and never once stop to recognize the contradictions. I left UFlorida and renounced tenure because I had colleagues who told me in advance that they would never promote me to full professor years before I even considered applying for that status. How can you know in advance unless it is racism and sexism, and you have predetermined that this Black woman, in your white eyes, doesn’t deserve to be your full equal. But rather than dispair, I moved on to other spaces/places where I could do institutional change and make a difference in the struggle for authentic diversity, equity and inclusion. Black lives matter in the streets and they should matter in the academy. Perhaps we should consider a symbolic “die in” at every annual meeting of the AAA to remind our colleagues that they are responsible for taking the light out of the eyes of the Black and other non-white studens who take their classes as undergraduates or grads and seek affirmation that studying your own as a “native anthropologist” is a worthy intellectual pursuit of happiness and intellectual energy. Perhaps such an action would remind those who have brutalized my Black colleagues in the tenure process by making them jump through hoops that no one else has to that it is their own racist and white suprejmacist views that drives them to practice microaggressions and institutional intellectual brutality. And for those (white) colleagues who are allies, such an action would remind them to be stronger and speak out louder, and given even more support when they see us embattled. And for the people of color who have become the new gatekeepers and symbolic overseers, shame on you–time to find yourself. When I entered anthropology almost 19 years ago as a late PhD and a born-again anthropologist, I had such high hopes for the discipline. It had the potential for internal change through cultural critique. Today, as someone who works outside the academy by choice, but still stays in touch, I can truthfully say there is still much work to be done. The potential remains still remans. This die in and the reflections about its meaning are just the beginning, not the end. This is not only Behar’s “anthropology that makes you want to cry,” it is also the anthropology of the future–that makes you want to take action. The moral of this column is that mentoring can occur in many forms; it can be something as simple as taking the time to leave a comment, placing your hand on the shoulder of an activist colleague who seems to be constantly under siege, and knowing when its time to step outside of the difficult situations, and take a breather. White allies or those whites who seem concerned, what you can do is speak up–“if you see something, say something!” Stop rationalizing racist behavior. Start believing your colleagues and friends(?) when they tell you how they feel. Stop making it all about you, and taking their moment and turning it into your concern that people might confuse you for a racist. If you are silent on acts of psychological, emotional and intellectual violence against Black people and other persons of color, then you are complicit. No getting around it, the shoe fits, and you have to wear it. At least until you get right, and start taking the risks that Black activists have been taking most of their lives. Start your own protest. What would it look like if a bunch of white people organized an event stating “Black Lives Matter because we White People Say So!” Just a thought from that part of my mind that says “if this were a good and perfect world, more white people would protest the violence that is occurring against Black people. Political activism is hard work for anyone. But Black political activism, Black feminist political activism, Black Lives Matter political activism is not only difficult, but dangerous. Each time we stand our ground and protest, we are at risk of bumping into a history of orchestrated individual and state violence perpetrated against Black people for over three centuries, and that the legacy of that violence continues today, and is reflected in the deaths of Black men that gave rise to the Black Lives Matter Movement. What they don’t realize is that we are stronger than that. Exhausted, yes. Frustrated, hell yes. But give in to injustice–to the hell No! Black activism seems to be hard wired into some of our DNA. Of course, like all genes, it can skip some folk, so don’t be surprised if some “skinfolk” failed to get involved. But also don’t be deterred, because as Donna Auston demonstrated, there is an entire generation of Black activists scholars who have been waiting in the wings, and have now taken center stage. ause othe history of abuse and brutality perpetrated against Black people in the Americas. We live with the legacy in our skin, in our memories, and in our ongoing daily interactions as we watch individuals and structures go out of their way to deny our humanity.